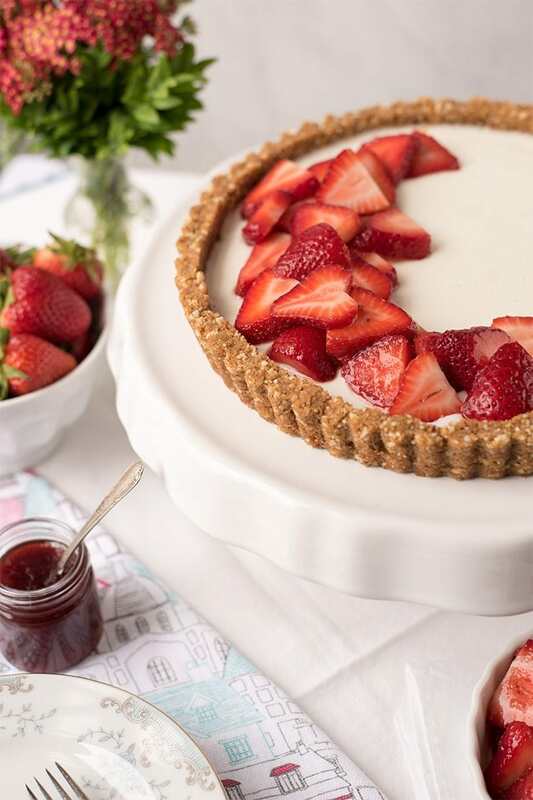 This Strawberry Panna Cotta Tart has a sweet almond, graham cracker crust layered with a creamy filling. Juicy, sweet strawberries are the star of this icebox dessert. 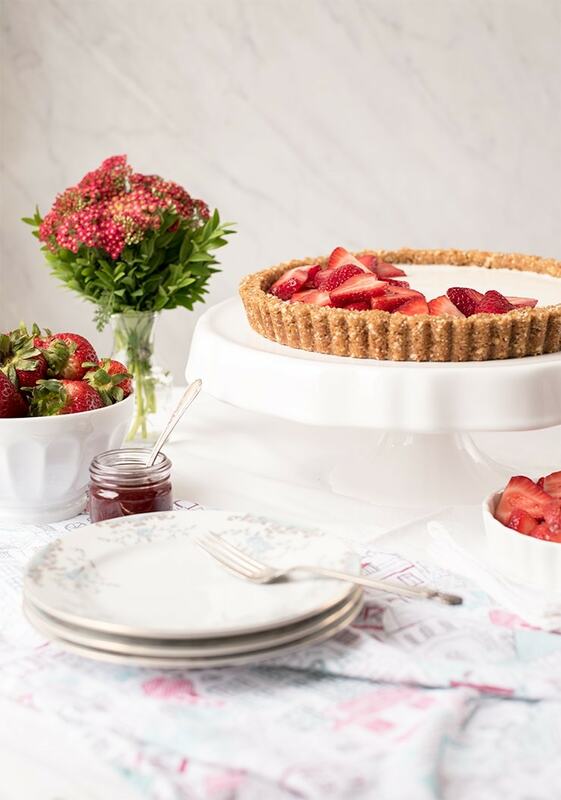 It’s a splendid way to highlight the beauty and sweetness of fresh, in-season strawberries. Strawberries are a year-round indulgence for me. They’re great in salads, perfect for breakfast with yogurt and always make a great dessert. But there’s something extra special about strawberry season. Maybe it’s childhood memories of picking strawberries at my Aunt Martha and Uncle Jack’s house… those school-free days in the hot sun lounging by the pool. Just beyond the fence, long rows of strawberry plants beckoned. It was a whole new version of hide and seek, searching under the canopy of leaves to find red-ripe berries…the over-ripe berries staining my little fingers. Eating some, filling the bucket and returning to the pool to cool off. To this day, I still eat strawberries straight from the garden. Few make it inside, but I’m not as adept at growing strawberries as Martha and Jack. There are no buckets to fill, especially after the squirrels get their share! But I love to pick them at local farms too. Not only are they more affordable this way, I also find local berries are the sweetest. I’m guessing that’s because they get to fully ripen before picking. 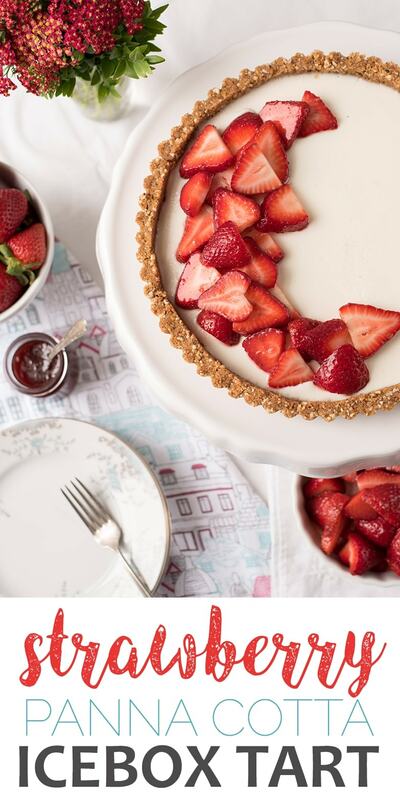 So, with that in mind, I created this tart to highlight an abundance of glorious strawberries! 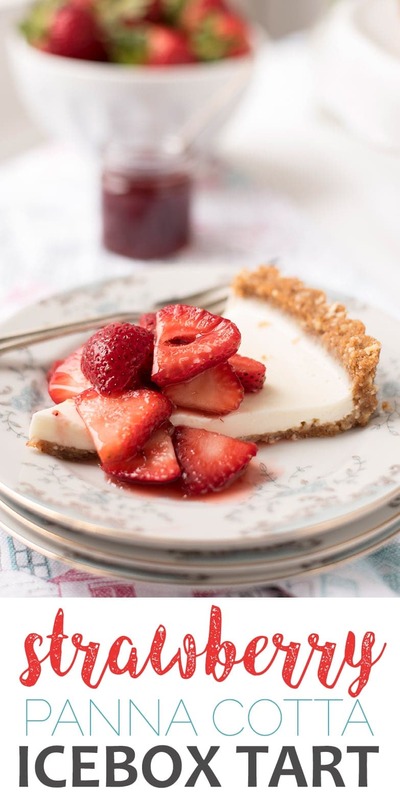 This tart has a sweet almond and graham cracker crust that is filled with a sour cream panna cotta. Together, they make the perfect accompaniment to sweet strawberries. There’s crunch, tang and so much creaminess! It really sets the stage for raw strawberries adorned with just a glaze of jam. The jam adds extra sweetness to the strawberries, but it also keeps them from drying out. 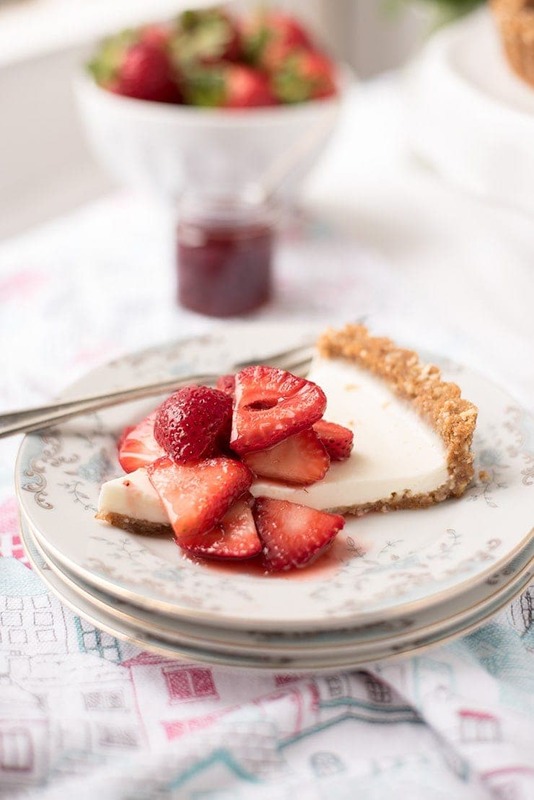 I used a store bought jam, but if you’re going strawberry picking and would like to make jam too, I think Kristen’s Honey Rum Strawberry Jam would be a great fit for this panna cotta tart. If you’re a rhubarb fan, this Strawberry Rhubarb Jam from Erika’s Gluten Free Kitchen would also be a lovely choice. It’s really hot here now and I didn’t want to spend a minute more in the kitchen, so I casually dumped sliced strawberries on the tart in a moon-shape, but you can decorate the tart however you’d like. The strawberries can be sliced in half or hulled and placed upside down on the tart… there’s really no right way. In fact, if you’d prefer, you can top individual slices with strawberries instead. This way is actually the easiest to cut and serve. 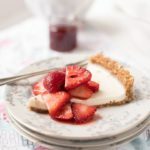 Just make sure you keep this strawberry panna cotta tart cold or the gelatin will melt again in the summer heat! 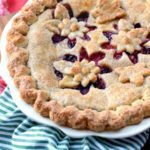 When it's strawberry season, I love a dessert that lets the berries be the star. 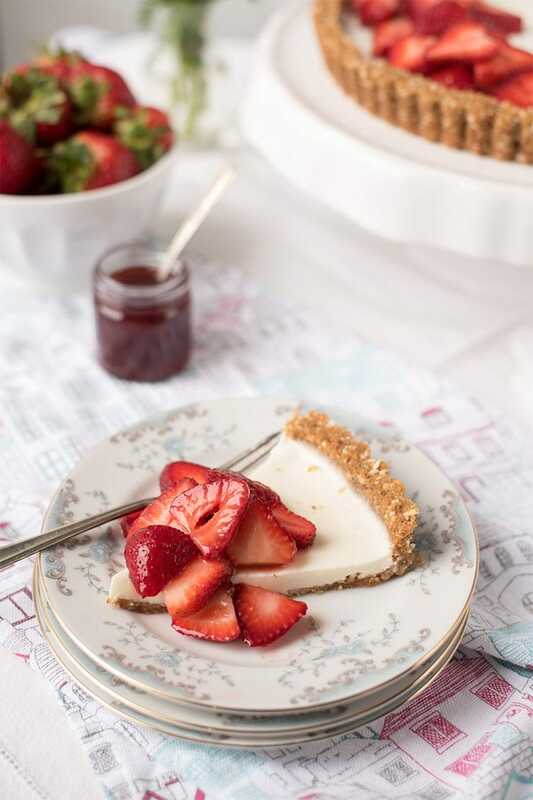 Here, the tangy sour cream panna cotta and graham cracker crust are a subtle complement to ripe strawberries. Combine graham cracker crumbs, ground almonds, melted butter and sugar in a bowl and mix thoroughly. Press into a 9 inch tart pan and place on a cookie sheet. Bake 12-15 minutes, or until golden. Let cool about 15 minutes, and then slip off the outer ring and place on a serving platter. In a small bowl, combine 1/4 cup milk and the gelatin for 5-10 minutes to let bloom. In a medium sized bowl, combine lime juice and sour cream and set aside. Meanwhile, in a saucepan, combine sugar and remaining milk. On low heat, cook the sugar and milk mixture until the sugar dissolves, making sure to stir frequently. Add in the bloomed gelatin and continue to cook on low until the gelatin has melted. Slowly drizzle the hot mixture into the sour cream while whisking. 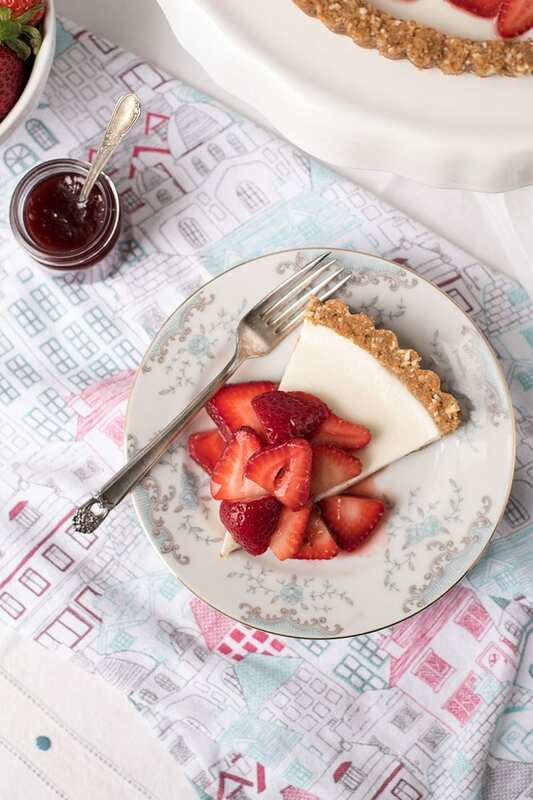 When ready to serve the tart, slice strawberries and toss in 1-2 tablespoons of warmed jam. 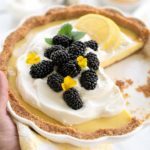 The berries can be placed directly on the tart, or served on top of individual slices. Don't let the gelatin get too hot or the tart might not set. Keep the tart refrigerated. It will melt in warm, humid weather. Anne. I love it when strawberries come in season too. Hope you like this as much as we do.